It used to be that Physicians were the highest income earners. Now, with Obama-Care, Medicare and the equalization of income, physicians are working more and earning less. 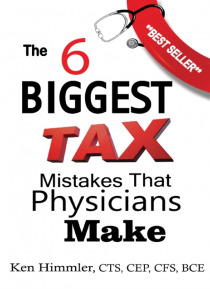 Now, from the financial planner that has worked with physicians for the last thirty years - a new manual on how to reduce taxes and hold onto more of what you are earning. Ken Himmler will teach you how to increase and hold onto… more income by using little known techniques to reduce tax and net more. This book is written specifically for physicians.